Great! You’re just one click away from this tax saving information! 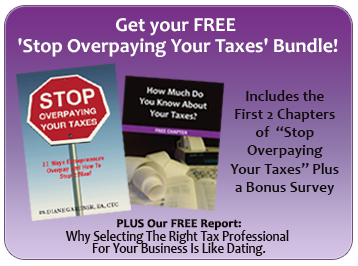 Learn the best strategies to stop overpaying taxes with this amazing download bundle, that includes 2 chapters of Diane’s new book Stop Overpaying Your Taxes. The first two chapters of Diane’s new book! Chapter 1: Who’s REALLY In Charge Of Your Checkbook? Did you know there are ramifications for choosing 1 of the 5 entity choices? Learn the advantages and disadvantages to each type and how they can cost OR save you money. PLUS A BONUS SURVEY! How Much Do You Know About Your Taxes? Find out how much you DO know and what you NEED to know. CLAIM YOUR FREE DOWNLOAD SO YOU CAN STOP OVERPAYING TODAY!